As previously reported Radiohead will release the DVD ‘The Most Gigantic Lying Mouth Of All Time’ (a collection of music from their recent album ‘Hail To The Thief’, as well as unreleased songs described it as a “110-minute excursion into the bizarre”) on December 1. Now to accompany it the band will be releasing an official 2005 calender, which has just been made available to pre-order from the band’s website www.waste.uk.com. 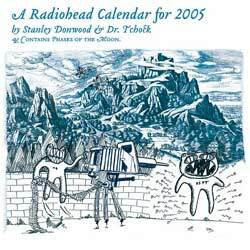 The calendar has been designed is by longtime Radiohead collaborators Stanley Donwood and Dr.Tchock (a.k.a. Radiohead frontman Thom Yorke) and contains many previous unpublished images and pieces of Radiohead artwork. For more information or to order a calendar go to www.waste.uk.com in the ‘NEW THINGS’ department. Orders will be despatched from mid November onwards. Previous post: DJ Shadow’s ‘The Gloaming’ mix rejected by label?